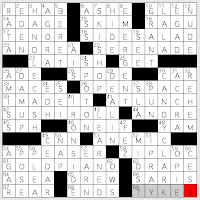 Maura Jacobson, of Hartsdale, N.Y., published her first crossword in the Sunday Times on March 6, 1955. Her popular weekly series of puzzles for New York magazine began in 1978. Maura has also been the traditional constructor of puzzle #6 at the American Crossword Puzzle Tournament, and she's made an ACPT crossword for something like 31 straight years. 64A. TWO FOR THE SEESAW is a [1962 Robert Mitchum/Shirley MacLaine film...or the outcome of 17- and 40-Across?]. The movie came out about seven years after Maura started constructing crosswords. 17A. [Playground situation #1] is TWENTY-ONE SWINGS. Hey, wait a minute. Swing sets generally have swings in batches of four or six, don't they? And the typical playground doesn't have anywhere near that many swings. Maybe six big-kid swings and four to six baby swings; that's it. 40A. [Playground situation #2] is TWENTY-THREE KIDS, leaving those TWO kids left over FOR THE SEESAW. Where do Americans usually bathe? IN A TUB ([Place for three men of verse]) IN THE U.S.A. ([Where Springsteen was born]), that's where. Would you label both of those partial entries, or just the latter? 28A. EDOM is the [Land of Esau's descendants]. 35A. NOLI [___ me tangere (touch-me-not)] is from the Bible, but I learned it in high school English (Wyatt's "Whoso list to hunt, I know where is an hind" sonnet). 69A. [There's nothing like it] clues a ONER, classic crosswordese. Means "a one-of-a-kind." 27D. [Coeur d'___, Idaho] is completed by ALENE. 55D. ST. LO is a WWII [Battle town of 1944]. 63D. [Washstand vessel] clues EWER. That's a water pitcher. 20A. ON ONE'S LAST LEGS. 36A. ENERVATED. This one's just a plain ol' word. 47A. TUCKERED OUT. I like to precede that with "plumb." This theme is getting to me with the power of suggestion—is it bedtime yet? I think it is. 56A. 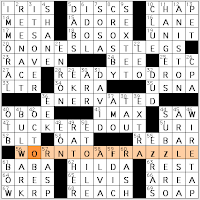 WORN TO A FRAZZLE. I don't say that one at all. "I'm frazzled," sure. Friend of mine recently wrote on Facebook that she'd "edited her brains to a nub." I like the "brain worn to a nub" image. Like Monday's L.A. Times puzzle, this one is pretty easy and has a bundle of 7-letter answers in the corners. Is it really Wednesday? BULWARK! That's a cool word. It means 41D: [Defensive wall]. I haven't got much else to say about this puzzle, but I did like the colorful theme entries. Also? I wasn't kidding about feeling all TUCKERED OUT. See you tomorrow! 42A. [Rice and fish concoction] SUSHI ROLL --> sushi bar and the (automotive) roll bar. 18A. [Small order of veggies] SIDE SALAD --> side bar (think of the trial portion of Law & Order and the request of either the DA or the defense attorney for, "Side bar, Your Honor?") and salad bar. 30D. ["American Graffiti" actress] CANDY CLARK --> candy bar and Clark Bar (itself a kind of candy bar...). 61A. [Extravagant instrument once owned by Elvis] [GOLD PIANO --> gold bar and piano bar. This is my fave. And then we come to 40D [Raymond Burr detective role]... which is IRONSIDE. Now the first thing I noticed here was -SIDE—which repeats the theme fill at 18A. This gives us two side bars. And what's this? Now we have IRON BARS as well. Additionally, this "bonus" crosses two "official" theme-fill entries. I may be in the minority here, but I wish Randy had resisted the temptation to include this quasi-bonus theme fill. For my money, it's a pretender and with that repeated -side especially, muddies the impact of this theme-rich puzzle. How do you feel about this? "I MADE IT! "/[Cry after a tough journey]. SPOT ON/[Exactly]. I have a thing for this phrase. Just love it. DEAL IN/[Give a hand to]. Fine misdirect here. Not assist or applaud (too long anyway), but cards. Nice. PUN/[Something that may not be intended]. But just as often is. 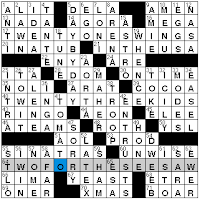 1A, 64A: [Source of inspiration for this puzzle's theme] is OBAMA / DRAMA. 17A. [Presidential concern about insufficient checking account funds?] might be a BANK CARD FAILURE, playing on bank cards and bank failure. 25A. [Presidential concern about a conflict between tall, skinny dogs?] is the AFGHAN HOUND WAR (Afghan hound, Afghan War). This one's my second favorite theme entry. 42A. [Presidential concern about biased reporting on bloodsports?] 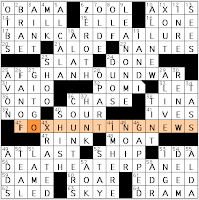 is FOX HUNTING NEWS (fox hunting, Fox News). 56A. [Presidential concern about the wizard lobby influencing health care legislation?] is DEATH EATER PANEL (the Death Eaters from the Harry Potter world, "death panels"). I like this one best. With two 15s, two 14s, and a pair of 5s, this is a hefty theme. Sixty-eight squares? That is what accounts for a few more unfamiliarities than usual. 6A: ["There is no Dana. Only ___!"] is...well, it's not from The X-Files, that much I know. I don't know where ZOOL is from. Google tells me it's Ghostbusters, which I just watched a couple weeks ago, but it's spelled Zuul. (Whatever the spelling, I wouldn't have gotten it unless you asked me right after I saw that movie.) The second O begins OLF, or 8D: [Odor emission unit]. It's derived from "olfactus" so it makes sense but it was completely unknown to me. I guessed right there, but had a rougher time where 32A: [Brand of aseptically packaged tomatoes and sauces]/POMI met the last letter of 19D: [Rastafarian phrase expressing oneness between God and humanity]/I AND I. Both are new to me. Most embarrassing wrong idea: For 4D: ["Love is the only force capable of turning an enemy into a friend" speaker, familiarly], M**, my first thought was MR T. Er, no. 'Twas MLK. I like 27D: [Beginning, slangily]/GIT-GO. Did you know 6D: ZEROTH is a word? It's an [Ordinal that kind of seems fake but isn't]. 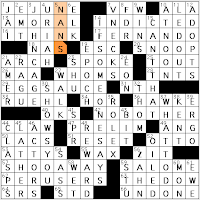 Brendan Quigley's blog crossword, "Something for Nothing"
Love the word JEJUNE, which is clued as [Kinda blah]. How many TVs these days still have a HOR(izontal) control? That's the old [TV measurement]. Couldn't think of what the [Company with the five-pointed crown logo] was until the crossings gave me the ROL and then it was so obvious: ROLEX. "FERNANDO" is [ABBA's biggest-selling single of all time]? That seems wrong. I'd choose "Knowing Me, Knowing You" or "Dancing Queen."